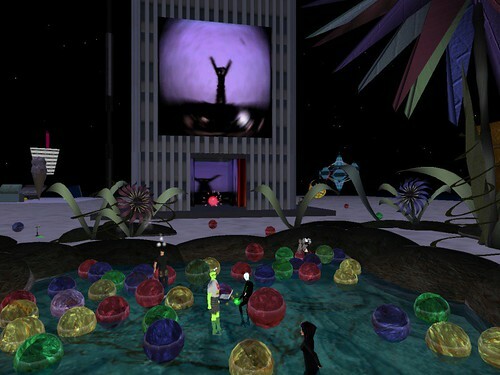 You will find me on-line at places like Facebook, Twitter, MySpace, Fairtilizer, SoundCloud, YouTube, Second Life, AltSpaceVR or here at my home page WidgetMuzikHaus.com. You can often find me in real life at Raves and Mega Dance Clubs like Miss Kitty's Parlour, Magic Wednesdays, Avalon, Vanguard, The Palladium, Cinespace, LAX, The Roxy, The Whiskey A-GO-GO, The Viper Room, and other crazy fun places. If I'm not on-line or out partying, I can be found 20 floors above LA in my skylab producing new tracks, vids, or interactive digital mega-fun-goo and spewing it all over the Internet. The goal of Muzik Haus is to bring Real Life DJs from around the World into a virtual reality space to experience and share DJing information about new bands, songs, remixes, audio production tools and DJ gear so they can be better real life DJs. The new music, software applications and DJ Gear we learn about from the global community of music producers and DJs in virtual reality helps each of us to be better DJs in the Real World. We teach real world DJs the skills to connect to the virtual world at Muzik Haus so they can DJ online. We've held reoccuring virtual events since 2006. Each event is unique with DJs from around the globe. This experience allows DJs in virtual reality to get instant feedback from listeners. We help new DJs to tune into music, dance, drink, eat, chat, make friends, join us at Muzik Haus to just have fun. Access to this global network of DJs from other parts of the world exposes DJs to new music and cultures. WidgetMuzikHaus is for promo use only.